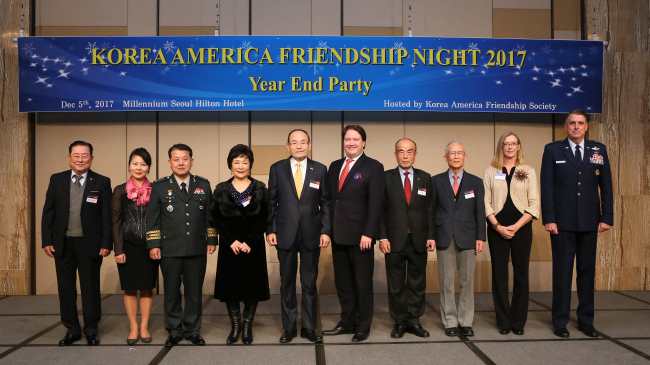 The Korea America Friendship Society held its annual year-end reception on Dec. 5 that celebrated the two countries’ deepening alliance amid growing military threats from North Korea. Some 360 guests, including military officers and noncommissioned members, diplomats, members of the KAFS and their spouses, participated in the event at Millennium Seoul Hilton. Music performances were provided by Songpa-gu Boys and Girls Choir. “Despite the tumultuous international relations surrounding the Korean Peninsula, with a growing possibility of conflict between the US and China, the relationship between Korea and America should be strengthened,” said KAFS President Han Chul-soo, former general and deputy commander in chief of the ROK-US Combined Forces Command. Seoul, Washington and their international allies and partners should enhance cooperation to counter the escalating threats from the North, Han stressed. He added that the security-based bilateral alliance has evolved into a comprehensive one, including an advanced economic partnership. Mark Knapper, charge d’affaires ad interim the US Embassy in Seoul, said 2017 was a busy year culminating in the state visit of US President Donald Trump to Korea, preceded by Defense Secretary James Mattis, Secretary of State Rex Tillerson and Vice President Mike Pence who came to Korea. General Kim Byeong-joo, deputy commander of the ROK-US Combined Forces Command, underscored that the alliance is not only signed on paper but forged in blood in the battlefield. “The KAFS has served as a reliable supporter of our alliance for the past 27 years,” he said, adding the organization has helped deepen friendship through seminars, ceremonies and cultural activities for veterans and soldiers.